downloaded the instructions ( all "36"pages) "help" and I am not even going to look at them until I return from our vacation. I do like the red and cream colour way I chose, and it has used up loads of my stash, but the borders have loads of appliqué sheep and trees. Red trees and sheep? I hear you say. Oh! Well, we shall see. There is one pink sheep in letter J, and I think he looks OK . 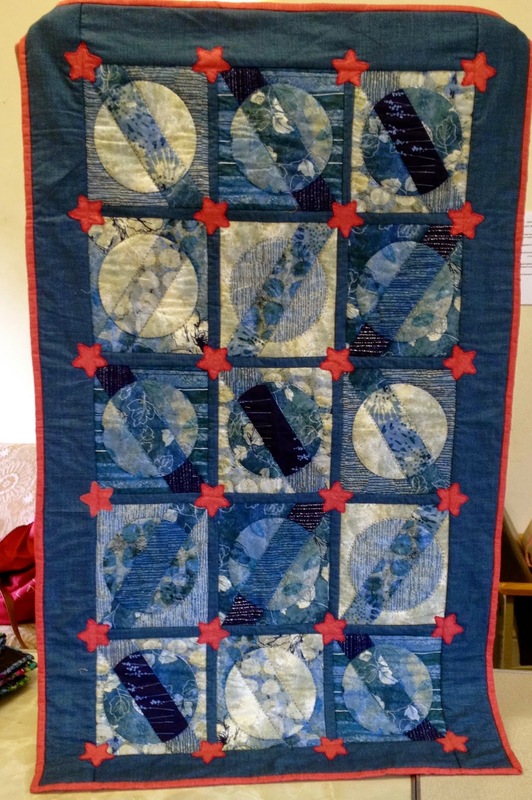 This was a BOM from The Quilt Show Designed by Janet Stone. 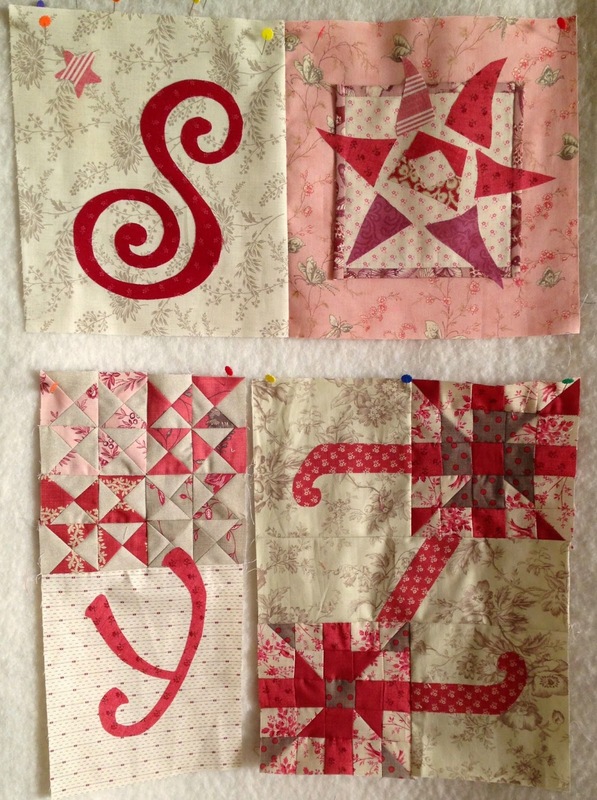 Our sew a row Charity quilt is coming along nicely. 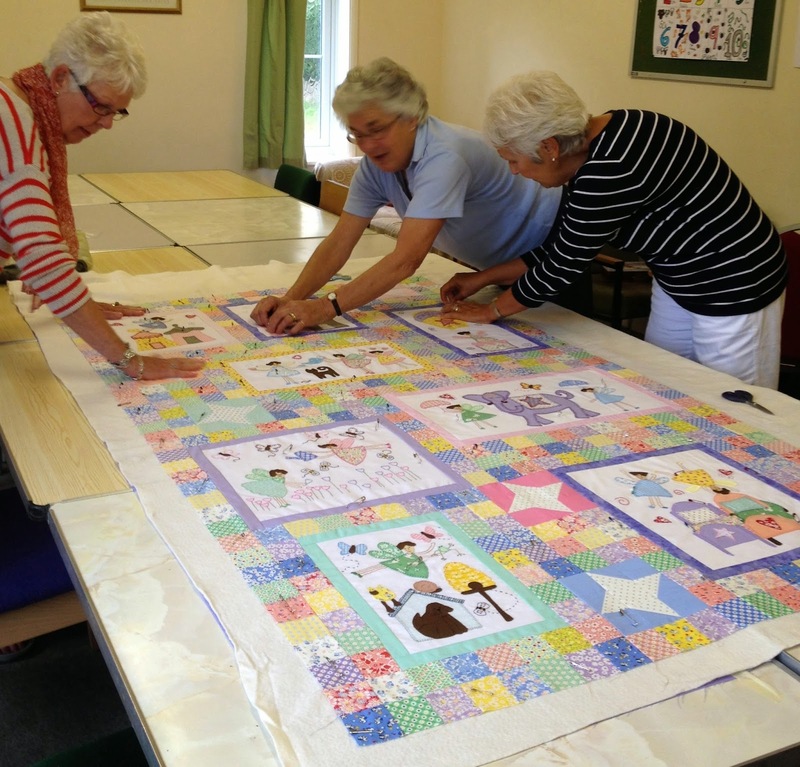 Each participant sews a row and adds it on to the last one. Jenny is the next one to have it and then I think Liz. 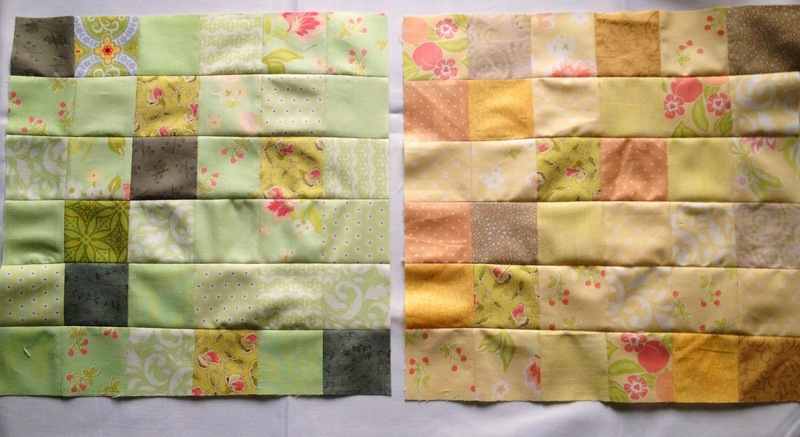 It will be sandwiched up with batting/wadding and backing and then each person will quilt their row. Where it got that name no one seems to know, but it's a great name for us. Yesterday Ann was making a bed runner for her daughters bed. 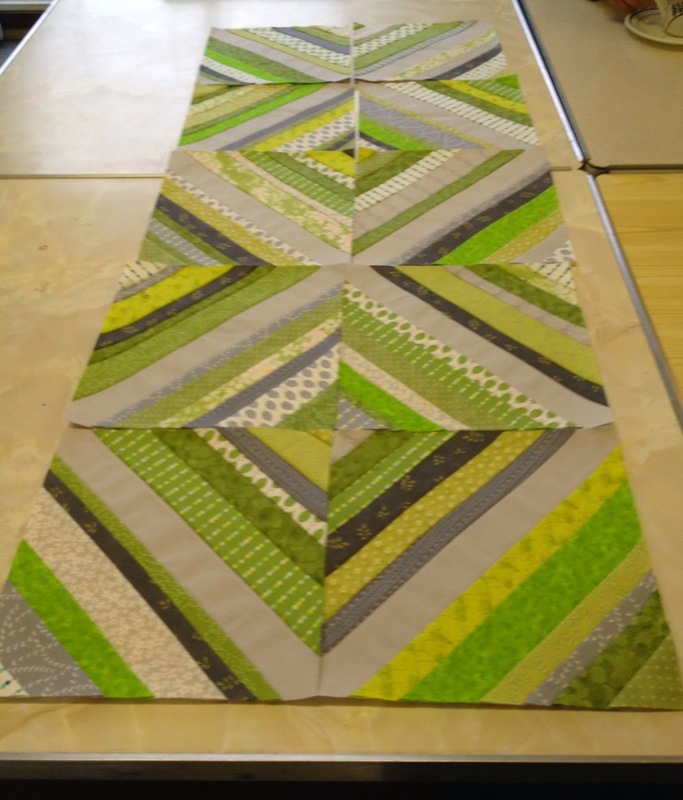 This is a flat shot as the 10" squares are not yet put together. This looks like another good stash buster, It's done onto a thin paper, centre strip first, then sew and flip both ways and then the paper is removed. Got to give this a go..
Now to write up a tutorial for my ST2 block for next month as I am the Mama for Nov and I can go with a clear conscience. Loose Ends indeed, or tidying up before our long awaited vacation. 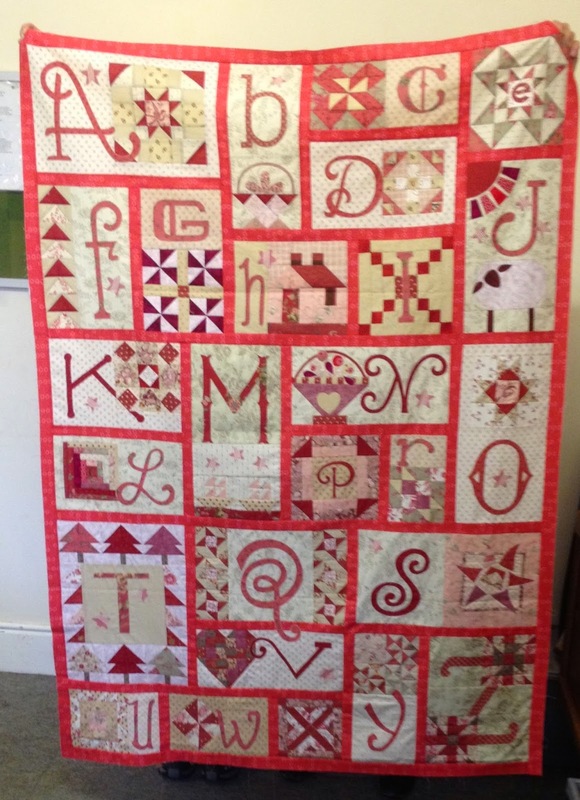 The last of the letters for the Alphabet Quilt are now done and need to be added to the rest of the top, then just the borders to do. Talking of borders, one border is finished on the appliqué quilt and the other three are 3/4 done so the end is in sight for the Floral Impressions quilt. I know that Deborah who designed it will be pleased that I am sill plodding on. 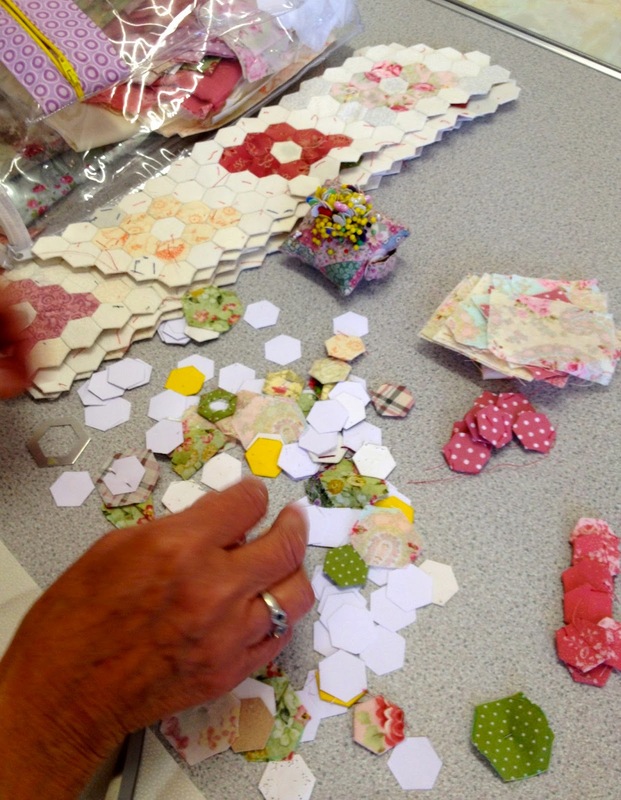 Yesterday we were all at the Bee and our first job was to help Sue sandwich her fairy quilt, she had just finished for her granddaughter, it is really lovely. This is a close up of one of the blocks, this elephant sure has attitude. 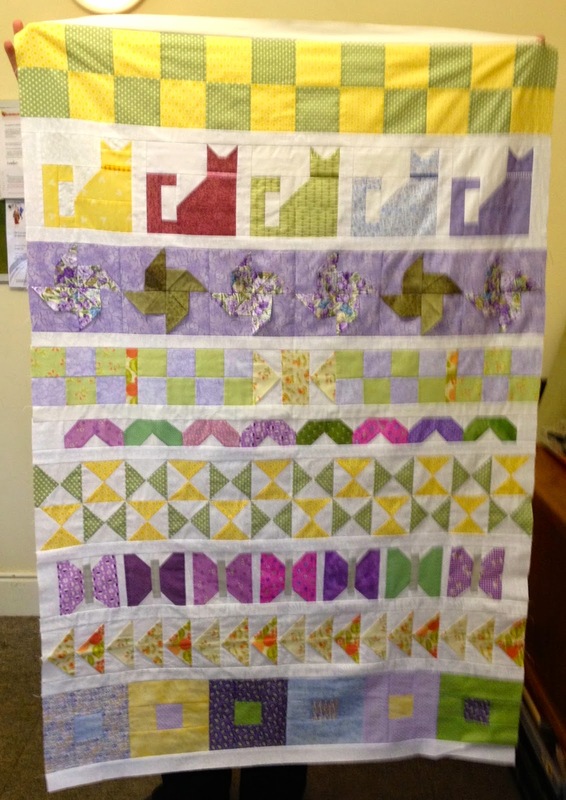 It is such a happy quilt and her granddaughter Eva is going to love it..
Ann was putting the finishing touches to her Lunar wall hanging. Annie was sorting out her 1/2 inch hexes, which reminds me that I have done nothing to mine for ages, perhaps I should take them with me on holiday, sitting by the pool sewing might just be what I need. Today I have done October's Siblings Together 2 Charity blocks as I shall not be back till November. So I can go away all up to date with sewing things. I am the Mama for the Siblings Together group for next month, so I do have to decide what blocks I would like every one to make. Then I can go off with a clear conscience. "Hello" to Liz and Rosie in Guernsey.